I love that football season has begun. I'm not one that could tell ya play by play on the football field, I don't really know much about it. But the atmosphere that football brings is one of my favorites:) It's like a season long of people going full out in theme and lots and lots of matching shirts! It's like a dream come true. 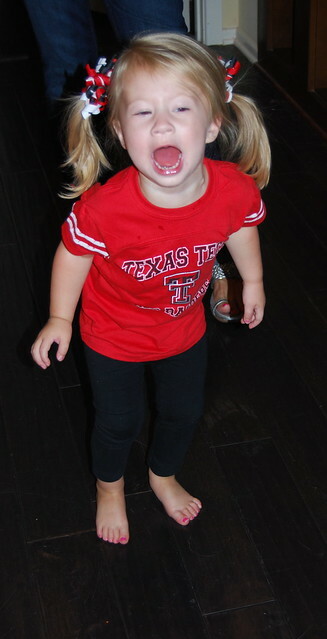 Today is Texas Tech's first game so we are all decked out in our red and black. 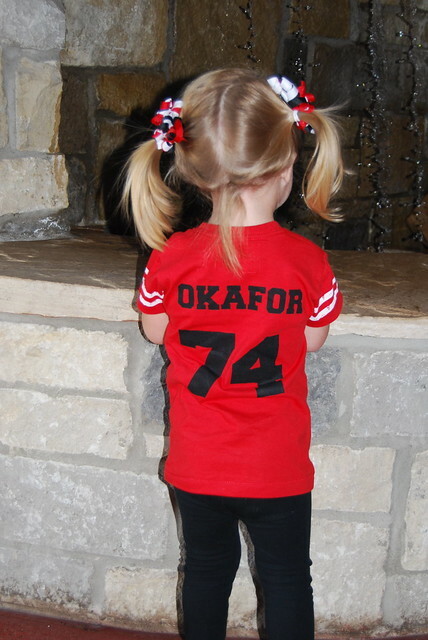 When it comes to Texas Tech football one name stands out...Mickey Okafor! We are some of his biggest and littlest fans. We all love Mickey so much, especially the little ones. Ben and Mickey have always shared a special bond. Mickey got a new football number this year so we had to make Ella a new shirt. I used the freezer paper method to put Mikey's name and number on the back of the shirt. We hope Tech has a good game today and we are excited to cheer on Mickey all season long! LOVE the jersey! So sweet!